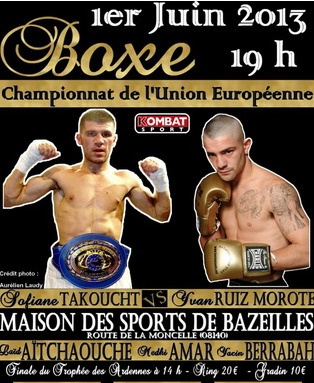 Takoucht retained the EU 126 lb title on a technical draw after Ruiz Morote was unable to continue after an accidental clash of heads. This was a voluntary defence. Mathis won the vacant WBFed jr middle title. Ibnel Arrai retired with an injured s4 oulder at the end of the fourth. WIBF, GBU and wow, GBC female feather titles. van der Hejden Dutch amateur champ.